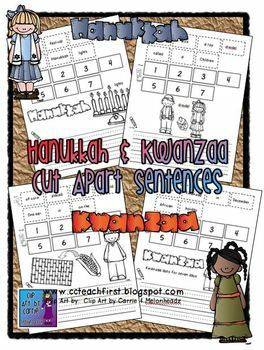 This set of cut-apart sentences focuses on Hanukkah and Kwanzaa. 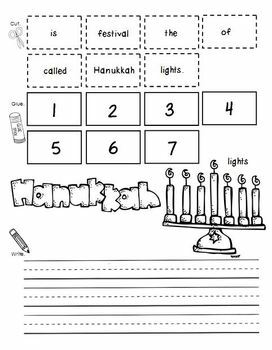 Students use the picture clues and what they've learned about Hanukkah and Kwanzaa to build a sentence that makes sense. Then they write the sentence correctly on the lines provided. Hanukkah is called the festival of lights. Hanukkah is a Jewish holiday in December. A candle is lit on the menorah each night. Children play with a toy called a dreidel. Children get a small gift each night of Hanukkah. 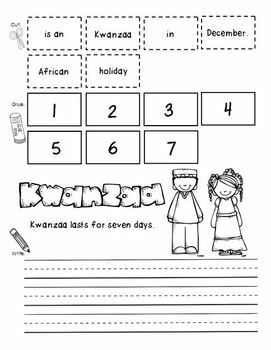 Kwanzaa is an African holiday in December. A kinara is a special candle holder for Kwanzaa. 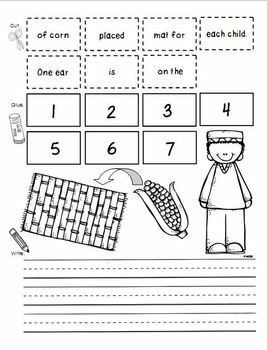 An ear of corn is placed on the mat for each child.